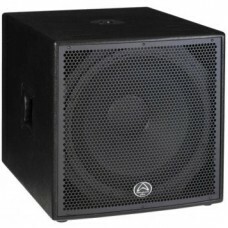 18" Passive Subwoofer box 3200W PRG @ 8ohm. High output, low distortion 18” cast frame woofer with a 3” voice coil. The Delta 18 uses a high output, low distortion 18” cast frame woofer with a 3” voice coil. Comprehensive array inserts are marked on the top panel for arrayed applications. Delta 18 is ideal when used in arrays and is equally at home in a wide variety of fixed installation and touring applications. Rhino Rock™, our new texturised composite finish is used in all models. This new finish provides the great look of a painted finish with the durability of a carpet covered enclosure giving you the best of both worlds. The Delta 18 is constructed from plywood and features a steel pole mount receptacle.